Company credit ratings from Fitch, Moody's and S&P are useful analytical tools to assess the financial strength of businesses. Their rather opaque coding means they are often overlooked. Here I propose my method for quantifying and easily comparing credit ratings between stocks. A company's credit rating always feels like the bridesmaid in the analysis of stocks. Whereas almost everything else boils down to something quantifiable, credit ratings with their numerous A's, B's, C's and more feel more like an episode of the "Sesame Street." But they are important. Of course, first is the default risk. Clearly, you would not want an investment to default on its debt leaving investors at risk. Yet the importance is more subtle, if a company is a debt risk or has a low credit rating then it may struggle to comfortably cover other obligations such as dividends. Here I propose my simple method for quantifying and therefore easily comparing the credit ratings of various businesses. Good question. I tend to compare companies I am analyzing closely with some of their peers. With only one or two comparisons, comparing credit ratings "letter by letter" is easily manageable and fairly effective. But more than a couple and the matter becomes a little tangled and confused. The matter is confused further by the fact that not all companies are covered by all credit agencies (indeed, few are). I could just drop it altogether. But, as I noted above, it is a valuable tool for understanding the health of a company. In response, I put together my approach to quantifying credit ratings simply between businesses. I have already used this in my recent review of Johnson & Johnson (NYSE:JNJ) and Campbell Soup Company (NYSE:CPB). Each credit rating from the main agencies (Moody's (NYSE:MCO), S&P and Fitch) has a number between 0 and 21. Each of the main credit "outlooks" are given a further figure: Stable is 0, Positive is 0.5 and Negative is (0.5). I then add these together for each credit agency's rating for the company and average the number between all those agencies covering the company. It is that simple. Let's run through it properly. Pretty good so far. 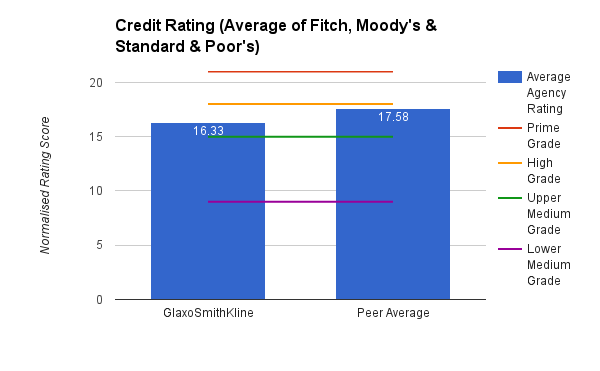 The average credit rating for GlaxoSmithKline would therefore currently stand at 16.6. That is safely in the upper medium investment grade. The credit rating agencies also give us another useful piece of information: the outlook. In sum, this is whether they think the credit rating for the company is looking likely to go up, down or remain the same. For this, they describe the outlook as being either "Stable", "Positive" or "Negative." Clearly, as a long-term investor this information is also valuable and needs to be taken into account. So how would this look for GlaxoSmithKline? This throws off an average of 16.33. Again, still in the upper medium grade but less securely so. I now have a credit rating figure to work with. Well, put simply, yes. I for one find it much easier to compare one company's creditworthiness with another's using this simple method. Here I am able to ascertain that both Novartis and Pfizer are considered stronger companies from a credit perspective with little more effort than ascertaining that 17 and 18 are higher than 16. Overall, I find this a compellingly simple way of ascertaining the creditworthiness of a company. As well as allowing me to compare a large number of companies with ease, it also effectively adjusts for the potential changes to their credit rating going forward. Credit ratings are, of course, only one of many ways of ascertaining the quality of a company. But I find them a useful shorthand to get a gist of its financial strength. I'd be fascinated to hear how anyone else handles the issue of credit ratings in their stock analysis and whether they have proposed improvements for the above system. I'd be quite happy to collaboratively refine this method in the future. NB: Unless otherwise stated, all graphs and the calculations contained within them were created by the author. Creative Commons image reproduced from Flickr user memnativ. Disclosure: I am/we are long GSK, JNJ. I wrote this article myself, and it expresses my own opinions. I am not receiving compensation for it (other than from Seeking Alpha). I have no business relationship with any company whose stock is mentioned in this article.